A sloped blue iceberg. Aboard the icebreaker Oden between the Amundsen and Ross seas. Photo by Lollie Garay. Satellite observations show that Thwaites Glacier, West Antarctica, has been thinning rapidly and its flow speed has been increasing. 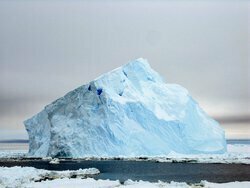 At the same time, its grounding line, the point at which the glacier starts to float over the sea, has retreated. Oceanographic studies show that the main driver of these changes is incursion of warm water in the deep ocean beneath the floating ice shelf that extends seaward from the glacier. An important factor affecting the flow of warm water towards the glacier and the stability of the ice shelf is the topography of the seafloor in the area, which is poorly known. The seafloor offshore from Thwaites Glacier and the records of glacial and ocean change contained in the sediments on it are the focus of the THOR project. The Nathaniel B. Palmer research vessel docked in Punta Arenas, Chile. Photo by Jillian Worssam. The team will be aboard the icebreaker NB Palmer in the Amundsen Sea, West Antarctica near Thwaites Glacier. Normally, participants onboard the NB Palmer share a two-person cabins with bathrooms on board the boat. Regular meals will be provided by the ship's crew. Work will be in labs on board and, possibly, on deck. Glad you found the pic to use, please grab whatever you need! !